Afghan Convoys Risk Taliban Attacks The Taliban are putting the squeeze on truck traffic across Afghanistan. Their main objective is to destroy U.S. and NATO convoys that supply Western troops in the country. But truck drivers say everyone who drives a tractor-trailer or tanker has become a target. 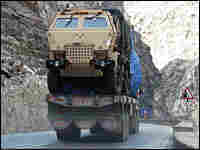 A Pakistani flatbed truck hauls a Western military vehicle through the Mahipar Pass on the road to Kabul. Taliban militants frequently use such passes to launch attacks on trucks and tankers in a bid to disrupt the U.S. and NATO forces' supply line. 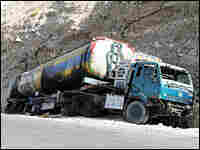 This tanker was one of dozens of trucks attacked by the Taliban on the road to Kabul from the Pakistani border last year. Getting supplies to U.S. and NATO troops in Afghanistan is a major headache for military leaders. There are few airports and no rail lines to speak of, so most supplies are trucked in from Pakistan on isolated roads rife with militants. New international supply routes are now in the works, after U.S. Gen. David Petraeus announced a deal last week with Afghanistan's northern neighbors and Russia. But Afghan truck drivers, who risk their lives daily to deliver the goods to the military, say it will take a lot more to keep them safe. U.S. Army Lt. Col. Jeffrey Wilson is a West Point professor currently serving as a senior American logistics officer. "I have a friend in charge of joint logistics command under the 101st Airborne Division. And the phrase he uses is that logisticians in this country 'move the ball down the field two yards at a time,' " he says. Wilson says this mountainous country, with more dirt roads than paved ones, poses challenges for even the most seasoned military supply experts. Compounding these challenges, of course, is the presence of a human enemy. That enemy is the Taliban. 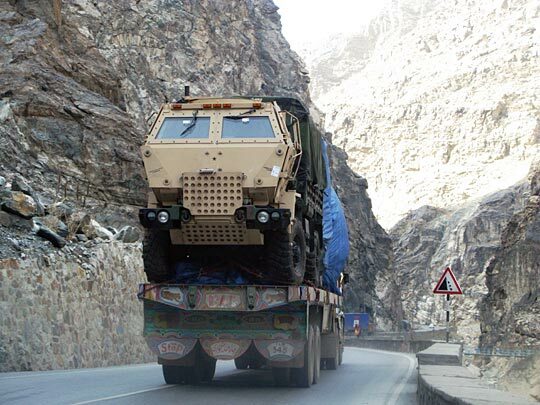 In the past year, Taliban fighters and their allies have increased attacks on all trucks and tankers inching along the roads leading from Pakistan. Officials say militants also have started blowing up bridges and overpasses on other major roads. 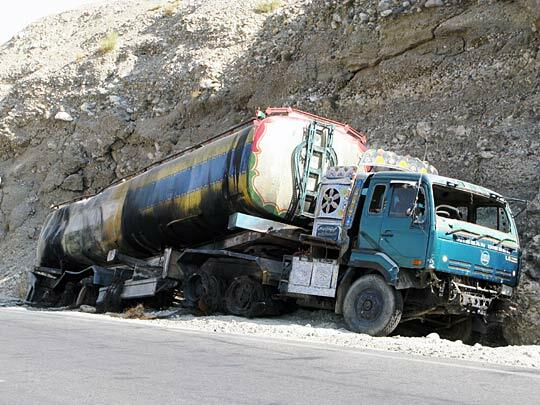 The Afghan Transportation Ministry reported more than 60 trucks were destroyed or hijacked in Afghanistan last year. A ministry official says that's the highest number since the government began tracking attacks. He estimates the actual number is even higher, given that most incidents go unreported. Still, Western military officials claim the attacks have not noticeably disrupted their supply lines. Wilson says more goods were successfully trucked in to U.S. forces in December than during any month in the past four years. Owners of Afghan trucking companies hired to deliver military supplies are far less confident. Mohammad Otmanzai, for instance, complains that the private security guards sent to accompany supply convoys make the trucks more of a target. Some of his drivers also have accused the guards of fleeing during attacks. Otmanzai adds that a few of his drivers refuse to haul military supplies anymore. Noorgol Otmanzai, who is no relation to the trucking company boss, is one of them. The 28-year-old says he quit after he and his younger brother were attacked five months ago while coming from Pakistan. Their tractor-trailer, which he painted with flowers and peacocks to make it look more like a civilian truck, was carrying cooking oil bound for a Kabul market. Otmanzai says the militants attacked them with rocket-propelled grenades and machine-gun fire. One bullet struck his brother, Mirwais, tearing through both of his legs. He says they managed to escape, thanks to a U.S. military convoy that turned up. The Americans returned fire and drove the militants off. The spot where the brothers were attacked is a notorious pass two hours from Kabul called Tangeeyeh Abrisham. It's easy to see why it is a good place for insurgents. Atop mountains in the area, they have a direct vantage point on the trucks, which move very slowly because they are traveling uphill. Tankers and other trucks that have been shot litter the sides of the road. Some of them have been removed, leaving behind black marks. Recent U.S. and Afghan military operations appear to have curbed attacks in the area where the brothers were ambushed. But they and most other Afghans interviewed for this story believe that putting more soldiers on the roads is the only way to ensure lasting safety. U.S. Army Col. Gerald O'Hara, a spokesman for U.S. forces, says he appreciates the truckers' concerns. He notes that there's a new initiative where drivers can report incidents directly to the U.S. operation center via cell phone, thereby decreasing the response time. But he says there aren't enough troops there — foreign or Afghan — to guard all of the country's roads all of the time.